The model range of notebooks from ASUS is rather interesting. One and the same case may contain different components, which is reflected in the model number. In this case, "J" means that it's an Intel Centrino Duo notebook with external (or discrete) graphics controller. Remember that we previously tested the V6V model (Sonoma, discrete graphics). This logic is quite clear - notebook exterior changes nowadays much less dynamically than technical "innards". 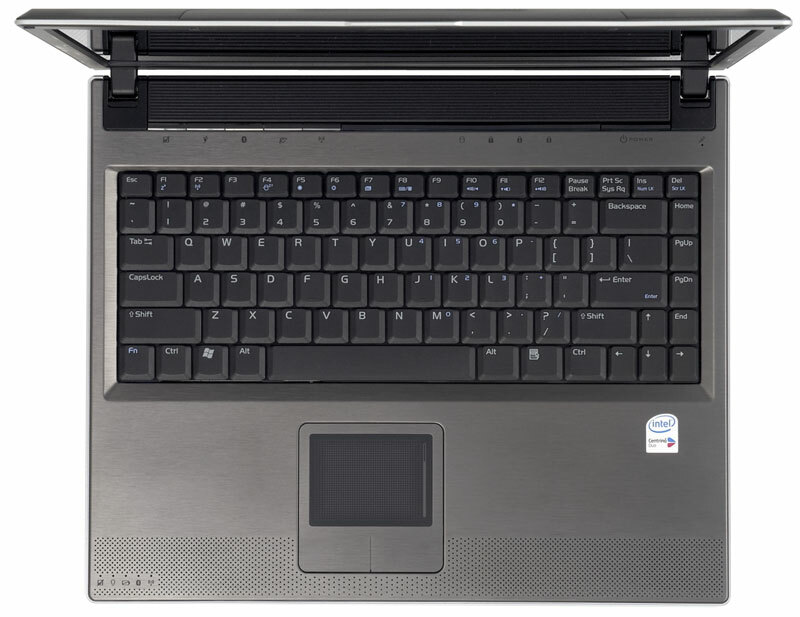 Besides, one and the same case may be used for a notebook on the Intel or AMD platform. As you can see, our sample under review has a top bundle. 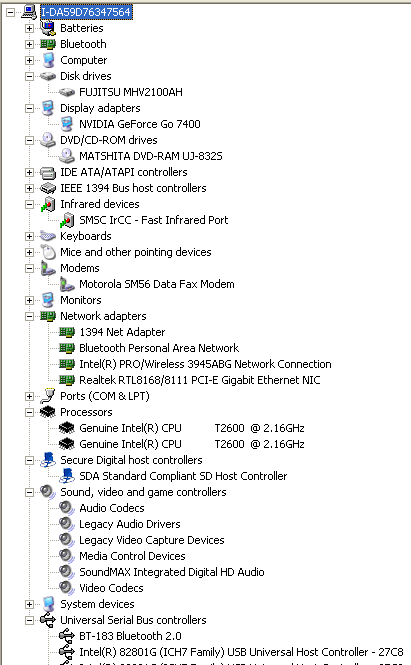 Specifications of devices installed in this sample can be seen on the screenshot of Device Manager. We have tested just a sample, so the approximate bundle can be reviewed by the official data on the manufacturer's web site. The bundle is traditionally rich. The global ASUS web site characterizes this model as "The Symbol of Success and Style". The notebook really looks expensive and elegant. As far as I know, the L-shaped lid is used only in ASUS notebooks. It highlights originality of this model. The layout of ports is rather original, but well thought-out, in my opinion. Two far USB ports are for a keyboard and a mouse, the one closer to you is for USB Flash Drive. It's up to a user to decide what device to connect to the middle port. LAN cable is removed out of sight. Modem cord? It should have been placed as far as possible. 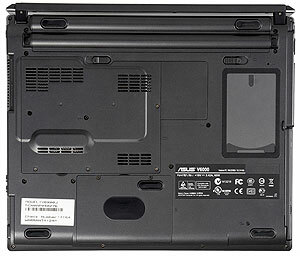 On the bottom of the notebook you can see a HDD bay (on the photo below) with an anti-shock plate, a CPU and memory bay, mini PCI bay (to the right of the CPU bay on the photo) and a reset button (over the card holder on the photo). We have some doubts only about the location of the IrDA port. On the other hand, this port is a rare thing in modern notebooks. According to the new test procedure, we weighed the notebook with an AC power adapter and cords. The real weight is even a tad lower than in the specifications. Pay attention to the light-weight AC power adapter. There is no display lid latch in this model. We found no backlash of the display lid in our sample, noticed in the V6V model. Either the locks got better, or our sample was less "worn out"
The interior of this notebook is practically no different from the V6V model. The insides are of the techno style, traditional for ASUS (at least, as I understand it). What concerns the keyboard, it was modified, but the author, carried away by the panel tests, just paid no attention to it. It was pointed out in out forum (speaking of feedback benefits). Unlike the V6V model, the left Shift key is of a normal size, but Enter lost its convenient L shape. The touchpad is usual for ASUS notebooks — very effective and rather convenient. It's a pity this design does not include scrolling buttons — you will use the touchpad for this purpose. In return, the gap between the keys is illuminated with blue. A stripe of control buttons and indicators is located above the keyboard. The number of buttons is unusually great — 5 buttons plus the power button. Traditionally from left to right — lock touchpad, Power4 Gear +, Bluetooth on/off, launch browser, wireless LAN on/off. The main indicators are in the bottom left corner. The display lid also houses wireless, Bluetooth, battery charge, and AC power indicators. 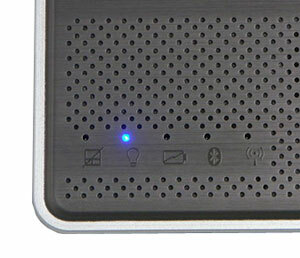 All the indicators and the power button are illuminated with blue. The notebook looks very attractive when it's on. What concerns audio, built-in speakers are placed in the fore part of the working area, before the perforation. According to the manufacturer's web site, this solution helps avoid sound reflection from surrounding surfaces. But these speakers get blocked by your hands when you work. On the whole, it's a truly stylish notebook, especially spectacular when it's on. Illumination and indicators are implemented in the same style. Subjectively, the notebook panel is quite good. But there are some glares, standard for "Color Shine" panels. This model enjoys ZBD LCD policy (Zero Bright Dot LCD Policy). 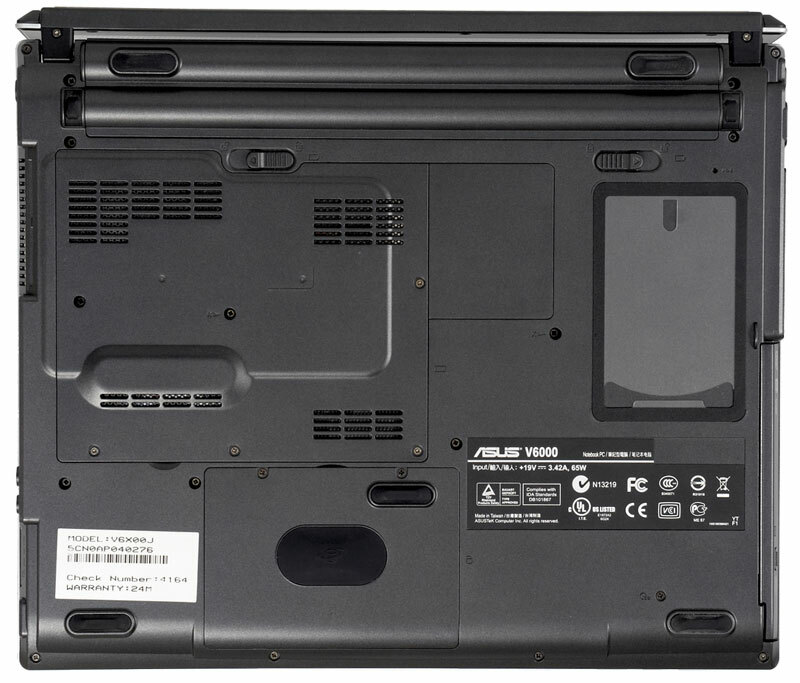 Even if a bright dot appears on the panel within 30 days after the purchase, ASUS guarantees a free replacement. You can look at the complete instrumental test results here, the main results are published in the table. We can draw a conclusion that the panel offers a good and contrast brightness level - its main drawback is small viewing angles. 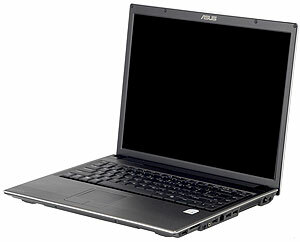 Since February 2002, all ASUS notebooks have been enjoying limited two-year international warranty. A full list of service centers can be found at http://www.ixbt.com/portopc/www.asusnb.ru. The main service center for notebooks, wireless and networking equipment is in Moscow at the following address: 119331, 5-3 Vavilov st, Office 110. Office hours — Monday-Friday from 10 to 18. ASUS tech support hot line: (495) 23-11-999. Database of drivers, utilities, and documentation is published on the global web site of the company. A competitor seems to be obvious - ASUS V6V. Clock frequencies of processors in our samples are practically identical - 2.16 GHz in V6J versus 2.13 GHz in V6V. But the new model is equipped with twice as much memory. And video systems are different - NVidia GeForce Go7400 128MB in V6J and ATI Mobility RADEON X600 64MB in V6V. There are some problems with comparison validation. The fact is, when V6V was tested, SysMark 2004 was not used yet. Besides, SysMark 2002 applications do not support multiprocessing. So we should take into account that the latest software versions (Adobe Photoshop, for example) will give a start to dual core configurations. Nevertheless, the model is at advantage even in the old test, which is quite natural. Now what concerns battery life. There is no point in publishing the graphs, I guess. Performance in battery mode has grown (it used to be 226), which conforms with SysMark 2002 results, considering that the set of applications in MobileMark hasn't been changed since 2002. Battery life has also grown (it used to be 157 minutes in Productivity test and 160 minutes in Reader test). But if we consider the absolute figures - the battery life of 3 hours is too short. Probably the most critical moment is 3D graphics. Let's see what the new model can offer. The advantage of V6J is at least 15% and it grows together with resolution. Theoretically, the advantage must be even higher in 3DMark03. That's exactly what happens. Unfortunately, even 3DMark03 games in maximum resolution are not quite playable (fps does not exceed 50 for all games except Wings Of Fury even in No AA mode). So a notebook will not replace a desktop computer for a gamer in the nearest future. That's quite obvious at least proceeding from power consumption. In conclusion we publish the results of memory bandwidth express tests, obtained in RightMark Memory Analyzer. These results are OK for the Centrino Duo platform. A showy case got state-of-the-art technical components. I think that the notebook will catch fancy of quite a wide range of users. Unfortunately, the model with Intel Core Duo T2600 2.16 GHz was not available in stores at the time this article was written. ASUSTeK Computer Inc. for the provided notebook.